Mouthwatering vegan black bean soup made with roasted poblanos and tomatillos, corn, red onions, carrots, celery, and cilantro. 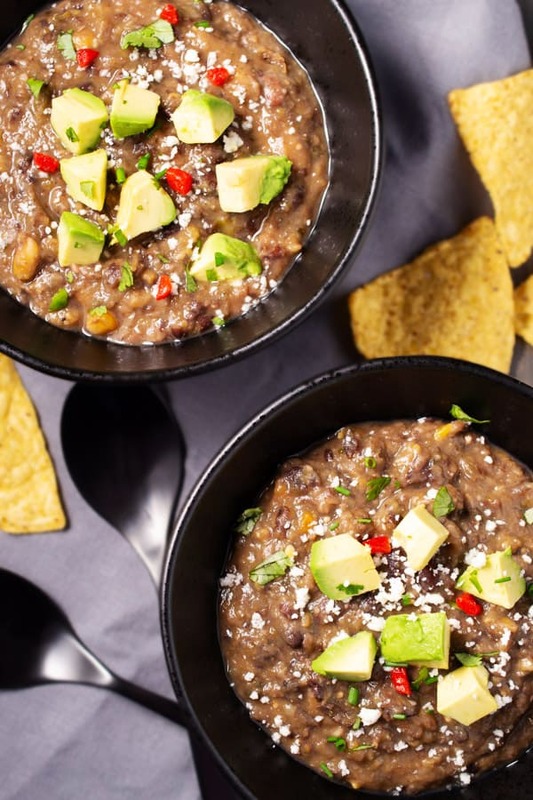 This recipe is not your ordinary Black Bean Soup. 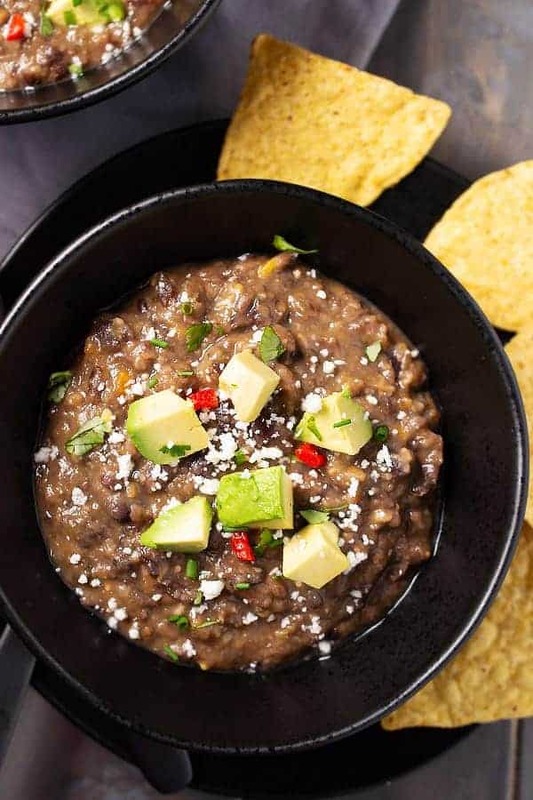 Awaken the taste of fresh home cooked black beans with roasted poblano peppers and tomatillos in a sautéd mix of aromatic vegetables, herbs, and spices to create a mouthwatering soup layered with flavor and texture. It won’t take too much longer to cook everything from scratch, but the end result will absolutely be worth it. Stay organized to be efficient. Sauté and roast simultaneously to save time. Pressure cook the soup to finish preparing this hearty dinner. I recommend the Fagor Lux pressure cooker over other pressure cookers. Read my Fagor pressure cooker review to get a comprehensive evaluation of why it is so amazing. 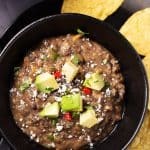 Black turtle beans or frijoles negros in Spanish (commonly referred to just as black beans) are the main ingredient in this hearty vegan soup. Black beans are dense, meaty, creamy, fudgy and earthy. The inky broth from the cooked beans make an ideal base for soup. 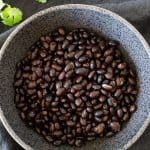 Grown and cultivated in the Americas, shared throughout the world, and beloved at home, black bean soup is an American classic. 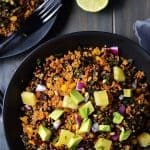 Soak black beans overnight for easier digestion and reduced cooking time. Poblano Peppers are mild chili peppers originating from Mexico. When roasted they have a spicy complex flavor, perfect for adding some heat to the soup. A relative of the tomato, green tomatillos are tart and have their own unique taste. They provide a sweeter flavor when roasted. Carrots, red onion, celery make an aromatic mirepoix. Mirepoix is a French cooking technique used to describe sautéing vegetables to soften them and bring out their taste in a flavorful base. Garlic, cilantro, cumin seeds, oregano, bay leaf and corn boost the flavor of the mirepoix. Vegetable or beef broth (if not eating vegan) cooks the black beans. Lime juice and salt balance and enhance the flavor of the soup. The first layer of flavor comes from roasted vegetables. This step is optional, but it adds a new dimension of flavor. An interesting scientific change happens during roasting. High dry heat causes the Maillard reaction (or browning) and develops more flavor in the food. The poblano peppers take 25 to 30 minutes to roast while the tomatillos only take 10 to 15 minutes to roast. Use food handlers gloves and cut the stem off the pepper. Slice it in half vertically and remove the seeds. Remove the husk from the tomatillos and cut them in half. Brush the poblano peppers and the tomatillos with a a high smoke point oil. Place the poblanos in the oven first. Turn them with tongs after 15 minutes. Add the tomatillos. Turn after 10 minutes. Keep an eye on the vegetables and remove any that have finished cooking before the rest of the vegetables are roasted. When everything is done roasting, remove the pan from the oven and cool. Place the poblano peppers in a bowl covered with a kitchen towel. As they cool, the skin loosens. Cover for about 10 minutes, or until cool to touch. Use food handlers gloves to peel off the skin. When the skin is removed, dice the pepper. In a hurry, you can substitute canned diced chili for fresh roasted poblanos and skip roasting the tomatillos. The soup base is the second layer of flavor. Take a few minutes to make a mirepoix with aromatic vegetables – red onion, carrots, and celery. A mirepoix is a French cooking technique where onions, carrots, and celery are slow cooked to soften and sweeten them. Dice the vegetables to equal sizes so they will cook quickly and evenly. Modify a traditional mirepoix ratio by using 1 cup red onion, 1 cup carrot, and ½ cup celery. Roast the vegetables while the mirepoix base is cooking. Make the mirepoix in the pressure cooker pot on the sauté setting. Cook the onions and carrots for 10 minutes, until they begin to soften. Add the celery and sauté for another 5 minutes until they soften. Add the garlic to boost the flavor, followed by the freshly ground cumin seeds, allowing the flavor to bloom as it cooks in the oil. When the flavor base is made and the vegetables are roasted, add the remaining vegetables, broth and beans to the pot. Close the lid and pressure cook for 25 minutes if using dry pre-soaked beans or 15 minutes if you are using pre-cooked black beans or black beans from a can. 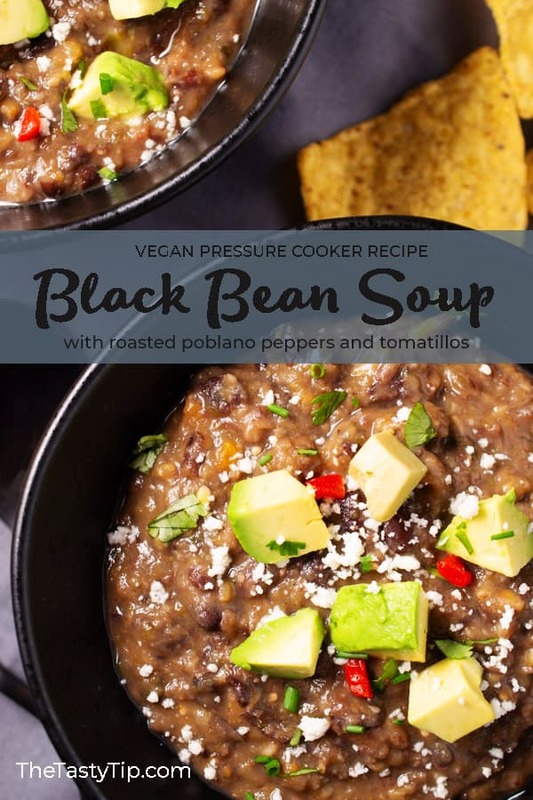 When the Black Bean Soup has finished cooking, allow the pressure cooker to release pressure on its own. This gives the beans a chance to cook a little more, resulting in a creamier bean and broth. Use an immersion blender to partially blend the soup. Another option is to blend half the soup in an electric blender and then return the pureėd soup to the pot and stir to blend. Add the lime juice and the salt. Taste and adjust seasonings as needed. Black Bean Soup tastes so good with a few garnishes on top. Try one to three of these garnishes for a tasty meal. Because there are three cooking methods used for this soup and because I don’t want to spend all day in the kitchen, organization is the key to making Black Bean Soup. 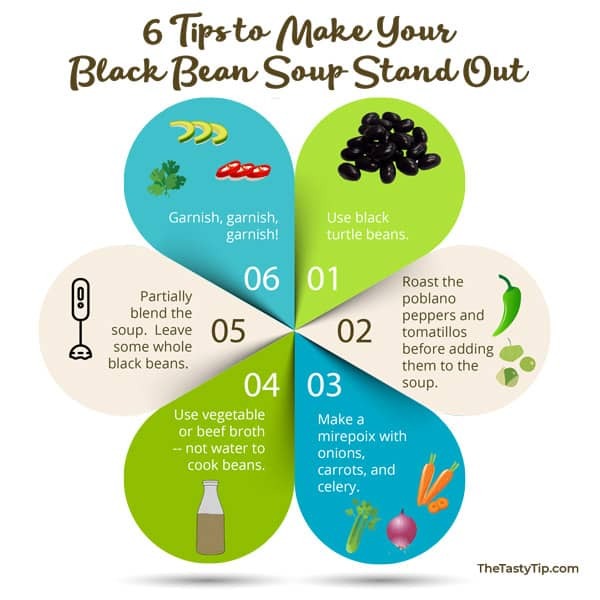 If you are in a hurry, you can still eat delicious Black Bean Soup. 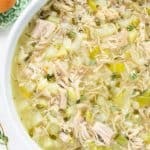 Throw all of the ingredients, except the lime juice and salt, into the pressure cooker. Pressure for 25 minutes, partially blend when finished, and add the lime juice and salt to taste. The ingredients and the garnishes will give the soup tons of flavor. Read the complete directions before you start. With organization you can roast and sauté simultaneously to save time. SOAK the black beans overnight in enough water to cover them 3 inches. DICE the red onion, celery, and carrot and mince the garlic. CHOP the cilantro and grind the cumin seeds with a mortar and pestle or a spice grinder. 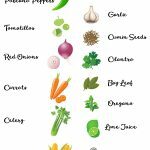 CUT stem off the poblano peppers. Cut them in half and remove seeds. REMOVE the husk from the tomatillos. Cut them in half. BRUSH the peppers and tomatillos with grapeseed oil. PLACE the peppers only on a baking sheet and roast in the oven for 15 minutes. When the timer goes off, TURN the poblano pepper over to roast the other side. Add the tomatillos to the baking sheet and roast for 15 minutes. COVER the poblano peppers in a bowl with a towel or plate on top for 10 minutes to cool. PEEL the peppers using food handler gloves. Chop the peppers. HEAT the pressure cooker on the sauté setting. When the pot is hot, add 2 tablespoons of grapeseed oil. While the peppers are roasting and cooling, COOK the mirepoix by sautéing the onion and carrots in the oil for 10 minutes. ADD the celery and sauté for another 5 to 10 minutes or until the vegetables are soft. STIR in the garlic and freshly ground cumin seeds into the mirepoix. Cook for 2 minutes. POUR the broth, beans, and the remaining ingredients, except for the lime juice and salt into the pressure cooker. PARTIALLY BLEND the soup with an immersion blender. STIR in the lime juice and salt. SERVE hot with 2 or 3 of the suggested toppings. *If using precooked beans, reduce the broth to 2 cups. 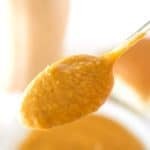 All images and content are © TheTastyTip.com. If you want to use this recipe and techniques, please take your own photos, write your own description, and link back to this page. Thank you. 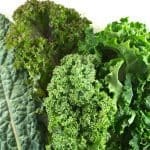 Nutrition information is an estimate only and may vary based on individual ingredients added and cooking methods used. 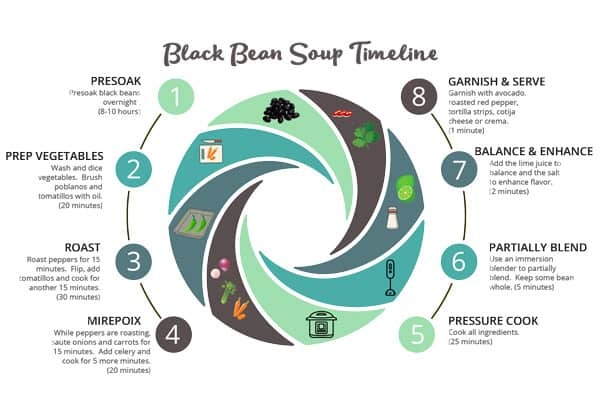 Did you taste all the layers of flavor in this Black Bean Soup Recipe? Comment below and let me know your experience. I'm Tami, the author, photographer, and creative force behind TheTastyTip.com. 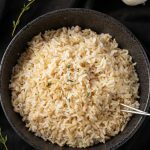 My daughter asked me to teach her how to cook before she went to college, so ... this is the result -- culinary tutorials, practical reviews, and real food recipes.